Designed to prevent conveyor belt damage due to long rods piercing the belt at transfer points or jamming the transfer point, the Model 6000 selectively detects long metal objects of a given diameter and length, as well as normal tramp metals greater than the rod diameter. The Model 6000 may be tuned to detect a rod of a given minimum diameter and length. The electronics controls will then trip only trip on rods of a greater length. 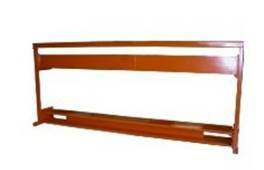 In addition to rod protection, the unit may be tuned to trip upon detection of other large metals. The control can be set to trip on objects that are larger than the set rod diameter, regardless of length. As with most Tectron units, the detector is also compatible with fabric or steel cord conveyor belts, and belts with metal splices. Tectron engineers design a custom or semi-custom detector that is specifically suited to the customer’s unique installation, requirements. Our flexibility at the design stage makes the Model 6000 a particularly good choice when retrofitting a unit in an existing installation.